The first opera ever to be completely sung in the invented Klingon language makes its debut in the Hague. This image was taken during rehearsals for the Klingon opera. Die-hard"Star Trek" fans may want to dust off their Klingon dictionaries and takea transporter to Europe for the debut of the first opera ever to be completely sungin the invented science fiction language. Tickets forthe performances were still available as of Friday morning, according toReuters. Klingon,which is spoken by members of the fictional "Star Trek"warrior race of the same name, has evolved into a significant pop culture phenomenonsince the Americanscience fiction TV series first hit the airwaves in the late 1960s. Fansworldwide adopted the alien dialect and made it one of the most popular constructedlanguages, opera organizers said. Even naturalwonders have taken on the fake sci-fi language. In August, Australia's JenolanCaves announced plans for the world's first audiocave tour voiced entirely in Klingon. 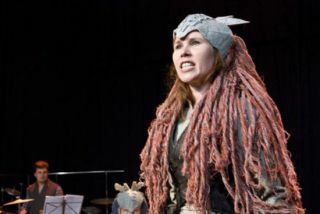 And, sinceopera occupies a large part of Klingon culture, the creation of such a show here on Earth seemedlike a logical choice, opera organizers said. In April,the show's producers sent a message out into the cosmos inviting the"real" Klingon community to attend the upcoming performances. Theinvitation was sent by a radio telescope to the Klingon home star, Arcturus. "TheKlingon are known as passionate opera lovers but at the same time very littlewas known about Klingon opera here, so as far as I was concerned that was avery interesting challenge to try and make an authentic, or as authenticsomething out of that as possible," the show's creator Floris Schonfeldtold Reuters Television. The90-minute production follows the journey of Kahless the Unforgettable. Afterbeing betrayed by his brother and bearing witness to his father's brutal death,Kahless faces his bitter enemy, the tyrant Molor. Along theway, Kahless fights to regain his honor by traveling into the underworld,waging epic battles, and reuniting with his true love, Lukara. The show waswell-received after a preview was staged Thursday evening, as reported byReuters. "It wasreally well interpreted, the music was really good, and the performance of theactors were fantastic," Reuters quoted audience member Erwin Slegers assaying.